The issue of the Western Sahara has now dragged on for 35 years with no apparent end in sight. This rather convoluted dispute entered into the consciousness of the world in 1975 when the Spanish colonialists left the Western Sahara and the Moroccan government asserted its authority over the territory that was occupied in 1884 and Algeria decided to harbour, arm and finance the Polisario whose leaders want independence of the territory. The dispute has created divisions in Africa. Indeed, Morocco, a founding member of the Organisation of African Unity, walked out of the pan-African body in 1984, after it recognised the Polisario’s political wing the Sahrawi Arab Democratic Republic (SADR) in a controversial decision by the then secretary general. Polisario, claiming to be the main liberation movement in the territory, declared an independent SADR on 27 February 1976, a day after Spain formally left the territory. There is no denying that the organisation has had a long lead over Morocco when it comes to the war of words – more so in non-French-speaking Africa- was no match to the Libyan and Algerian-backed Polisario in Africa because of the then ideological differences and the fact that Africa was divided into two camps: the moderates and the so-called socialist regimes. The apparently one-sided nature of this flow of information has more or less helped to prolong the stalemate that has developed over the Western Sahara issue. 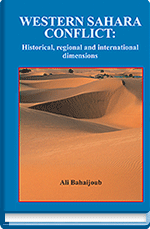 This is why this new book, Western Sahara Conflict: Historical, Regional and International Dimensions by Ali Bahaijoub, is most welcomed. As the title suggests, the book covers the whole gamut of the conflict from its inception to present day talks between the concerned parties. This has clearly contrived to throw a lot of light on an issue that has flummoxed so many. Each of the 27 chapters explains the role of one party or another and their respective claims. The interest of all the parties to the conflict is explained and well documented including the UN failed attempt to organise a referendum that had never materialised partly because of the nomadic nature of the inhabitants and partly due to disagreements on who was eligible to vote. Bahaijoub’s work is an extension of his 1987 PhD thesis, successfully submitted to the London School of Economics. Since then, the conflict has become even more complicated and confusing. In all this, it is the refugees in the camps who are the unfortunate pawns. Bahaijoub deplores their plight and point out, “it is worth mentioning that no international organisation is allowed into the Tindouf camps without the authorisation of the Algerian military command, and the refugees’ predicament will unfortunately continue to deteriorate regardless of the lack of transparency and accountability”. Not surprisingly, the Polisario has failed to come up with a true figure of the refugees in the camp so that the UN can organise a referendum to decide their future. Bahaijoub argues that this stalemate suits both the leadership of the Polisario and the Algerian military while the big losers are the people confined to refugee camps with no work prospect or freedom of movement. tangible source of income, operate some 50 “diplomatic” missions – a lot more than what many African states can afford? This is an interesting book that clearly explains the intricate nature of the Western Sahara conflict, drawing a great deal on published and unpublished documentation, independent sources, reliable books and journals and international accords. The author identifies numerous distinct and interrelated historical and political patterns of change on the regional, continental and international levels. But the most important bit of all is that we now have a volume that throws a completely new light on the long-running Western Sahara debate. Those who have been confounded by the arguments – legal or otherwise – would do well to get a copy of this book.